Crowborough town is a conservation area, being on the edge of the Ashdown forest and near to the famous 500 acre wood it offers a good variety of walks and has some stunning scenery and beautiful views. 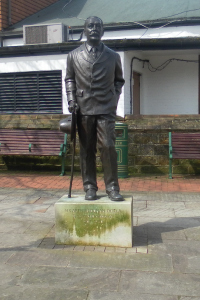 Only a few yards from our front door is another land mark cloaks corner where the statue of once local resident Sir Arthur Conan Doyle, creator of the character Sherlock Holmes can be seen and provides an excellent opportunity to enjoy our fish and chips while sitting on the benches. Each year the town has a large number of visitors staying at the highly regarded Crowborough Caravan and Camping site being well positioned to allow easy access to the seaside towns of Eastbourne and Brighton, also less than seven miles away is the Spa town of Royal Tunbridge Wells. The camp site is less than half a mile from our shop.